Illustration Courtesy of Magnum U.S.A. There are probably as many brands of boots on the market, name and no name, as there are calibers of rifles. Add the fact that almost every sporting goods, big box and little box store in the country carries boots of all sizes, shapes and description. The question and problem facing all of us is: Which boot should we consider for our ventures in the field. Deciding is not as difficult as one might think. First of all, look for a boot that meets US Army MILSPECS. They are the toughest standards in the world and with that in mind, you can eliminate over 95% of all the boots you see. Why MILSPEC? Well, if you or a friend has ever served in the military you know that, as a general rule, the equipment is the best, and that includes the boots. Rubber or pure polyether polyurethane soles are the only outsole authorized for durability and traction on surfaces in multiple environments and temperatures. Other materials may be lighter in weight but may have significant problems in these areas. The specifications for the sole material alone eliminates the majority of boots sold in the US, but remember, many years of testing went into developing that requirement. It is worth paying attention to. As to the requirement for non-mesh fabric, all I can say is, "it is about time." I cannot tell you how many sticks and cactus spines that I have had go through boot mesh. 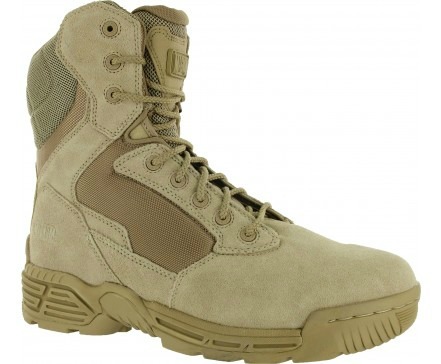 With all of the above said, we now come to the Magnum Stealth Force 8.0 boot. It meets all of the MILSPECS outlined above, as well as those we did not list. The only question is: are they that good? Yes they are! Mary has been wearing these boots continuously for three weeks. One of the features she noticed immediately was there is no break-in required. They fit comfortably from day-one. If you have back problems, you know that a good pair of boots is essential to preventing unnecessary pain. If you have boots that roll or turn when you are going up or down hill, you have a major problem. These do not. If you happen to be diabetic, you already know that blisters on the feet can lead to some really nasty complications, all the way up to amputation. In all of the weeks that Mary has used these boots, not blister one. As for traction, she has not had any difficulty navigating over gravel, rocks, sand and plain old dirt. The Stealth Force 8.0 have become Mary's new hunting boots. With an original MSRP $104.99 and now discounted to $94.99, they are an incredible bargain. In addition, they come with a 1 year warranty and a 60 day comfort guarantee. This you can't find anywhere else in the industry.